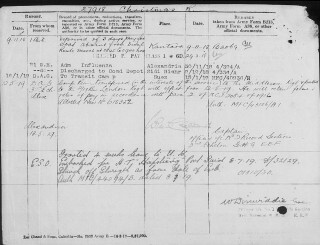 Reginald Christmas service record, 6th of 8. Reginald Christmas service record, 7th of 8. Reginald Christmas service record, 8th of 8. Reginald Christmas was recorded in the list of Absentee Voters for Bottesford, 1918/1919, as 27918 Pte, 2nd Leicesters, with the address ‘West End, Bottesford’. However, his service history was complex, and the records are in some respects confused. Reginald Christmas was born in Bottesford in 1896, son of Thomas Christmas, born in 1851 at March, Cambridgeshire, and Martha (nee Chapman), born in 1857 at Wrangle, south of Wainfleet and Skegness. In 1901, the Christmas family lived in one of the New Station Cottages (no.2 in the census) at the West End Bottesford. Thomas Christmas was employed as a railway signalman. The children at home were Edith (18, a dressmaker), Clara (17), Arthur (15, a gardeners boy), William (8), Florence (6) and Reginald (5). The three youngest were at school. In 1911, the family was still in the New Station Cottages (no.3 on the census). Clara and Arthur had left home, Edith was a dressmaker, William a farm worker, Florence in domestic work, but Reginald, aged 15, was still at school. 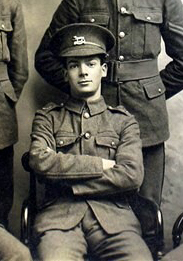 Reginald Christmas enlisted in Melton Mowbray on 29th February 1915, aged 18 years and became a private in the 12th (R) Battalion, Leicestershire Regiment: his Service Number was 27918. He also served in the Duke of Cambridge’s Own Middlesex Regiment, G/100900. However, his main service was with the 2/19th Battalion, London Regiment, based at Basra, in the Mesopotamia campaign. He gave his home address as Elton Road, Bottesford. He re-enlisted on 12/4/1916, giving his trade as a baker. He was awarded the Victory Medal and the British Medal for his war service, but not the 1914 or 1915 Star, presumably because his active service was counted from his re-enlistment in 1916. 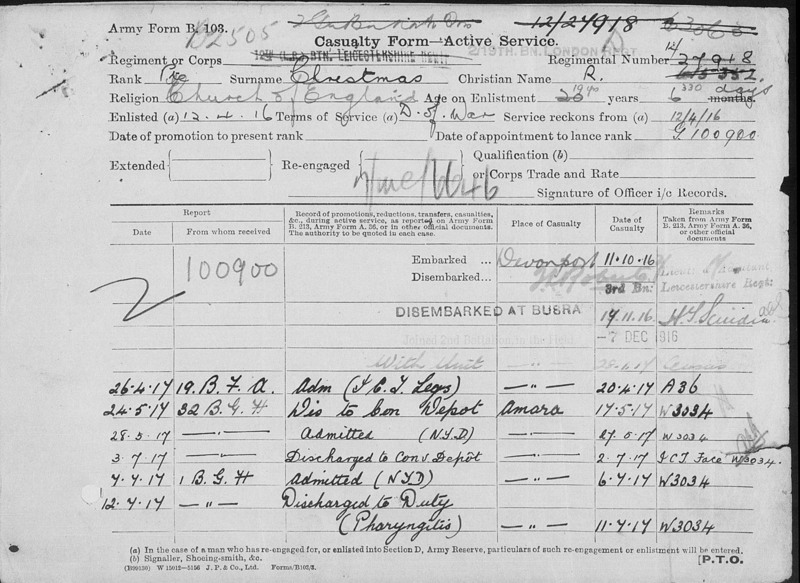 The service records for Reginald Christmas that were located online are confusing. Information is duplicated and contradicted, so that it is difficult to be certain as to their interpretation without further records, which have not been found and probably no longer survive. There are eight individual digital images of service records, which I shall call Forms 1 to 8, in the order they appear in the search results. Form 1: Casualty Form – Active Service B103: He enlisted on 12/4/16 as 615352 3rd Battalion, Middlesex Regiment. On 30/8/19 in the 3rd Middx transferred to dispersal station Clipstone. Form 2: The reverse side of Form 1 and shows further detail of his outline service history. Form 3: Statement as to Disability Z22. This has him in the 3rd Battalion, Leicestershire Regiment, on the date 25/8/1919, and here the service number 615352 is crossed out and replaced by 100900. Form 4: Medical History B178. This states that he enlisted at Melton Mowbray on the 29/2/1915 as 27918 12th (Reserve) Leicestershires, and then becoming 100900 Middlesex Regiment. 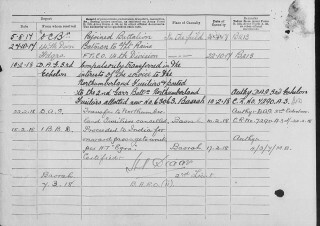 Form 5: Casualty Form – Active Service B103. This copy of B103 has the Service No. 12/27918 crossed out and replaced by G100900, enlistment date 12/4/16 “for the duration of the war” with the 2/19th London Regiment, but it also records that he landed at Basra as 100900 with the 3rd Leicestershires. 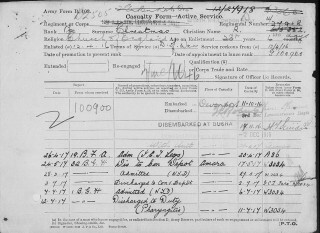 Form 6: The reverse of Form 5, continues his service records with no further revision of his service number or unit. Form 7: Another Casualty Form – Active Service B103. On this service no.27918 is crossed out and replaced by 615352, 2/19th London Regiment, 24/2/1918 – 17/10/1918. Form 8: The reverse of Form 7 and records him being issued with the ‘new’ service number 615352. It is probable that Reginald Christmas started his army career as a private in the Leicestershire Regiment, No. 27918. Born in 1896, he was only 18 in 1914, and must have been a pre-war Territorial to be in the 1914 mobilization photograph (on this site). He enlisted as 27918, 12th Leicesters, on 29/2/1915. 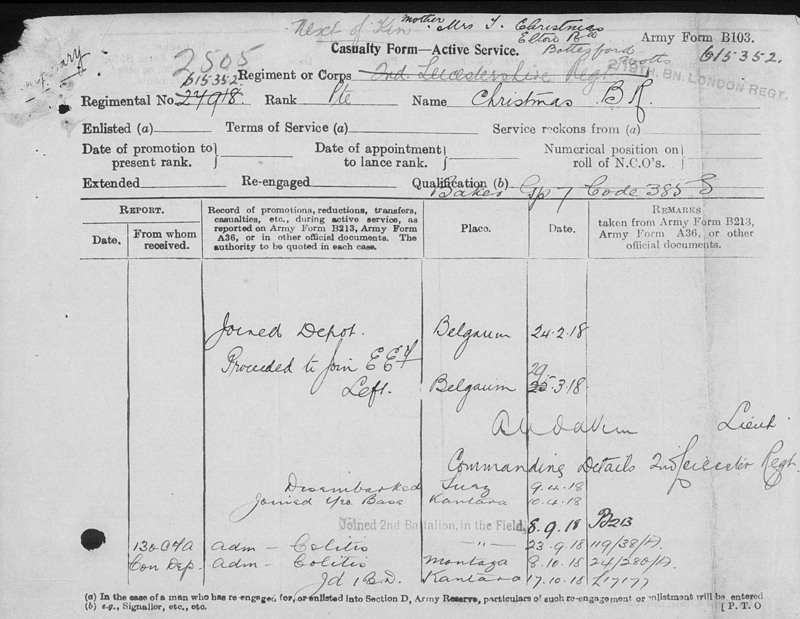 He re-enlisted on 12/4/16 as 615352, 3rd Middlesex, but was re-assigned Service No. G100900. However, it appears he had transferred to the 3rd Battalion, Leicestershire Regiment until he was posted overseas to arrive at Basra. This was a training battalion, which apparently never left the UK. When in Mesopotamia he was in the 2/19th Battalion of the London Regiment, apart from a brief transfer to the Northumberland Fusiliers in February 1918, which was rapidly cancelled. He was with the London Regiment until he was transferred on 12/5/19, back to the Middlesex Regiment, reverting to his original service number 615352 until his discharge on demobilization, 31/3/1920. 11/10/16 – Embarked Devonport with 3rd Leicesters, arrived Basra 17/11/16 and joined 2/19th Battalion London Regiment. 8/7/19- Granted two weeks leave to UK. Embarked “Hapsburg” Port Said. Struck off Strength as from date of embarkation. Electoral Rolls: Autumn 1921: Martha and Reginald Christmas at West End. Autumn 1923, Autumn 1924: Thomas, Martha and Reginald Christmas at West End. 1927: Reginald and Isabel Christmas live at 10, Cairn’s Yard, St Annes, Nottingham. Reginald Christmas married Isabella Lumsden (1895-1992) from Bathgate, West Lothian (Linlinthgowshire) in 1923. He died in September 1973, and his death was registered in Nottingham. 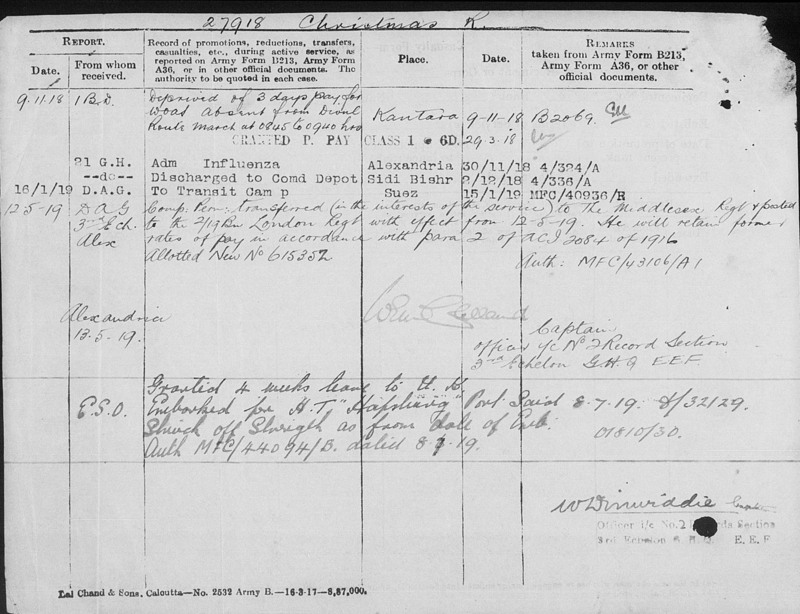 In the following summary, he is recorded as being part of the 3rd Battalion, Leicestershires. 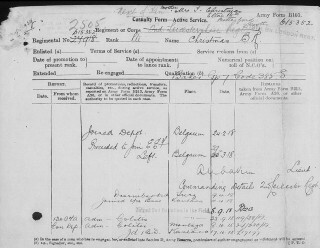 The service records for Private Reginald Christmas are rather confusing, and his assignment to the 3rd Leicesters is made provisionally until more records can be located.